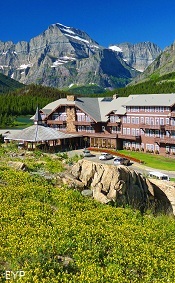 The Many Glacier Hotel rests in the heart of Glacier National Park. 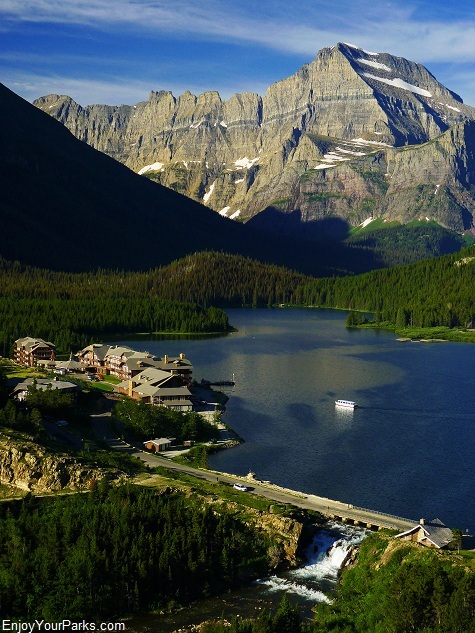 This is a view of the Many Glacier Hotel and Swiftcurrent Lake in Glacier National Park. 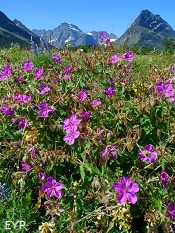 Looming in the distance is Mount Gould. 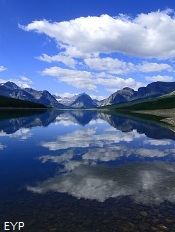 The Many Glacier Area in Glacier National Park is known as "The Heart of Glacier Park". 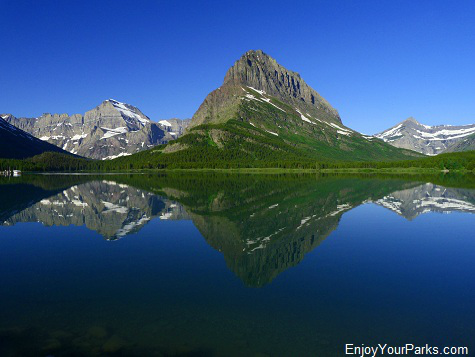 With that being said, you really, really need to spend plenty of time here during your Glacier National Park Vacation. 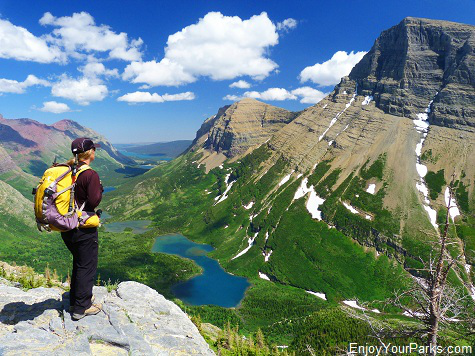 The Many Glacier Area offers some of the greatest hiking trails in North America, and is home to four of the "Top 10 Things To Do In Glacier Park". 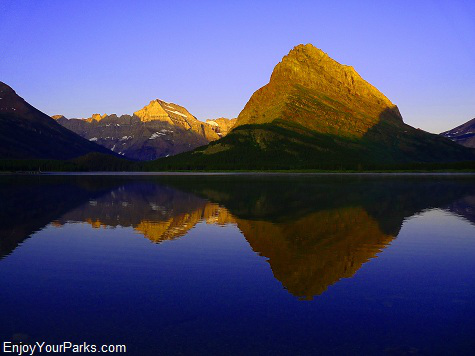 Mount Wilbur reflected in Swiftcurrent Lake in the Many Glacier Area of Glacier National Park. 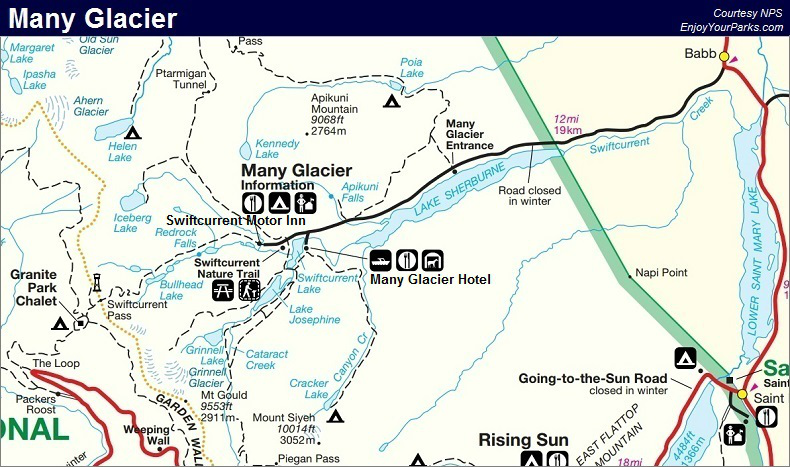 The Many Glacier Area in Glacier National Park includes the world famous Many Glacier Hotel, Many Glacier Campground, and the Swiftcurrent Motor Inn, as well as the trailheads of the Grinnell Glacier Trail, Iceberg Lake Trail, Swiftcurrent Pass Trail, Ptarmigan Tunnel Trail, Grinnell Lake Trail and the Cracker Lake Trail. 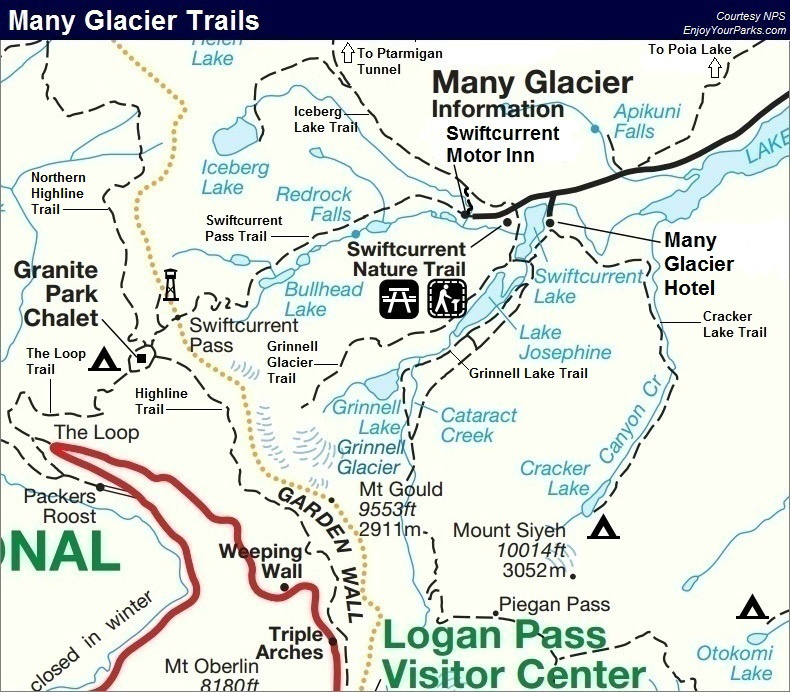 Every single one of these trails are legendary. 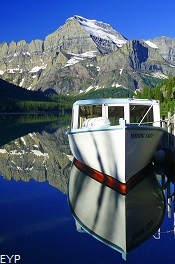 The historic wooden boat Morning Eagle on Lake Josephine, with Mount Gould in the background. 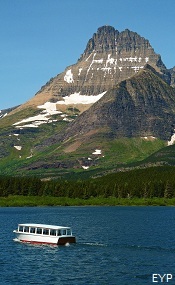 The Many Glacier Boat Tour in Glacier National Park is a "Must Do" while on your Glacier Park vacation. 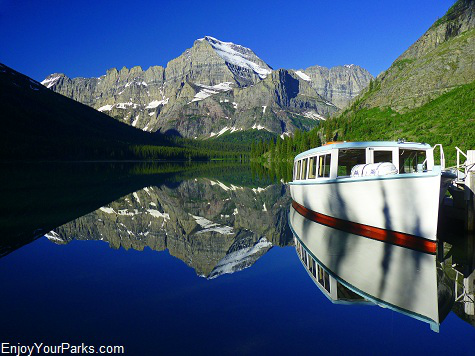 The Many Glacier Area in Glacier National Park is also home to the celebrated Many Glacier Boat Tour, which is one of our "Top Ten Things To Do In Glacier National Park". 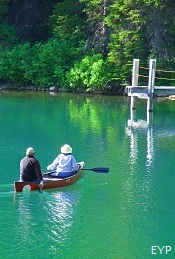 This incredible boat tour takes you on two famous lakes on two historic wooden boats! 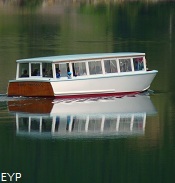 More more information on the Many Glacier Boat Tour click here. 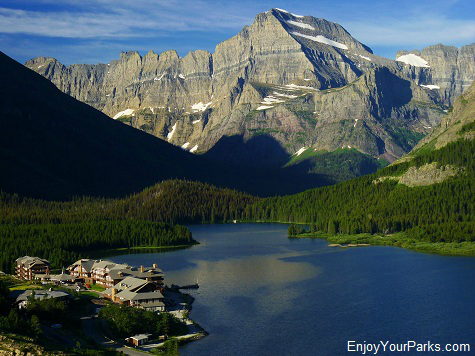 The Many Glacier Hotel in Glacier National Park sits on one of the most picturesque locations on earth! 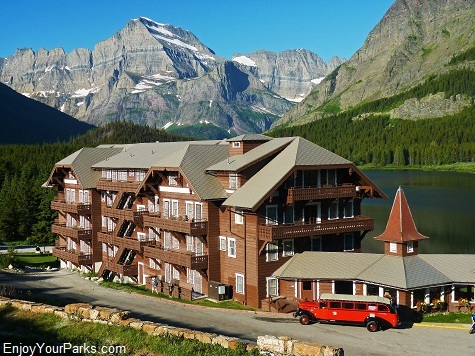 The Historic Many Glacier Hotel was built in 1913 and it rests on one the most beautiful locations on earth. 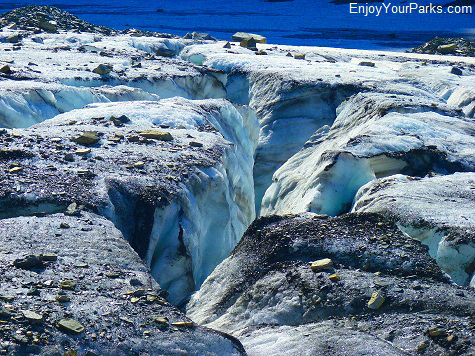 The view from this world famous Hotel is awe-inspiring to say the least. 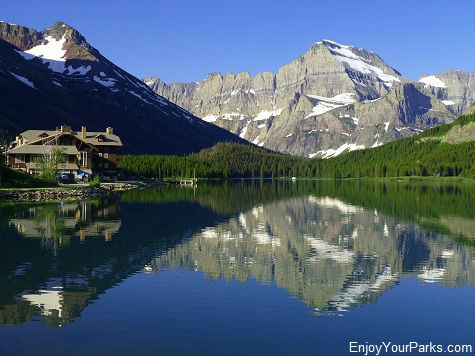 This view is so extraordinary that Louis Hill of the Great Northern Railway took one look and literally HAD to build a hotel here because it was so perfect! 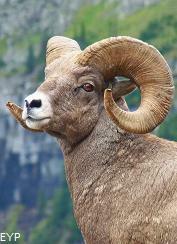 And thank goodness he did! 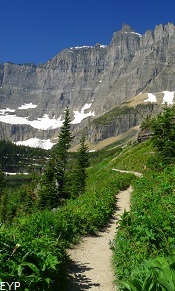 Just up the road from the Many Glacier Hotel are three of the greatest hiking trails on the continent. 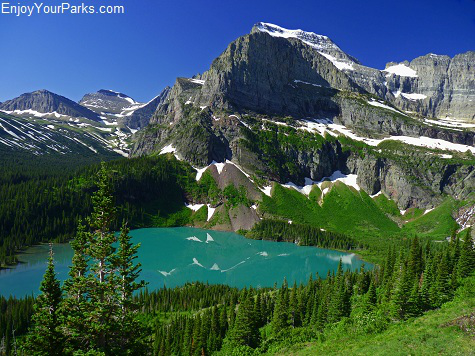 Grinnell Glacier Trail, Iceberg Lake Trail, and Swiftcurrent Pass Trail are absolutely amazing, and are definitely among the "Top Ten" of Glacier National Park. 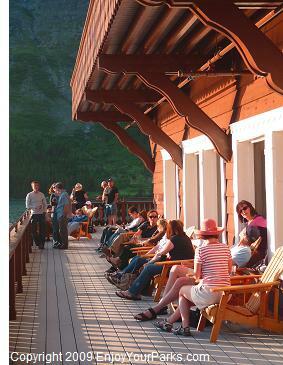 Many Glacier Hotel Deck, Glacier National Park. 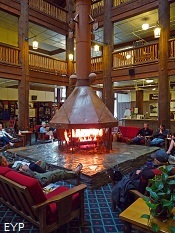 Many Glacier Hotel Fireplace, Glacier National Park. 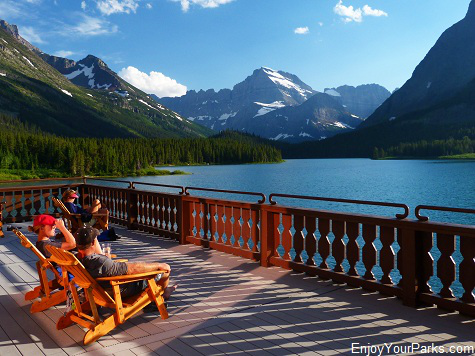 We also adore the huge outdoor deck that overlooks one of the most impressive views in world (we're not kidding). 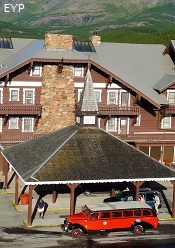 This view is what inspired Lewis Hill, owner of the Great Northern Railway, to build this magnificent hotel in the first place. 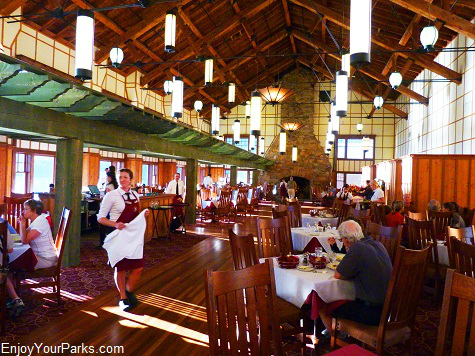 And whether you are actually staying at the Many Glacier Hotel, or you are staying just up the road at the Swiftcurrent Motor Inn or the Many Glacier Campground, this wonderful Swiss style lodge is there for you to enjoy. 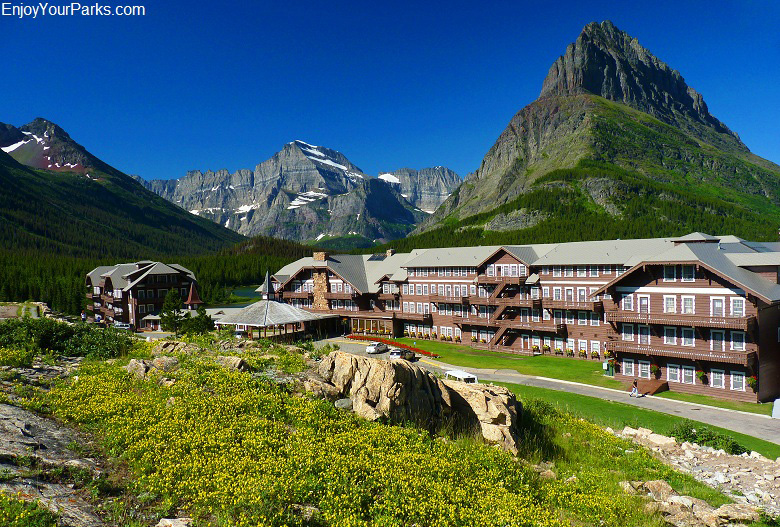 The Many Glacier Hotel in Glacier National Park is one of the truly great lodges of the world, and it's a "must see" while visiting Glacier. 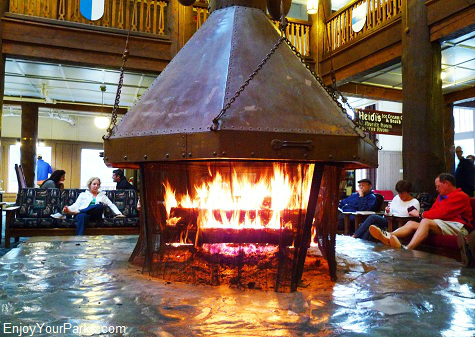 The Many Glacier Hotel Fireplace is one of the coziest fireplaces on earth! 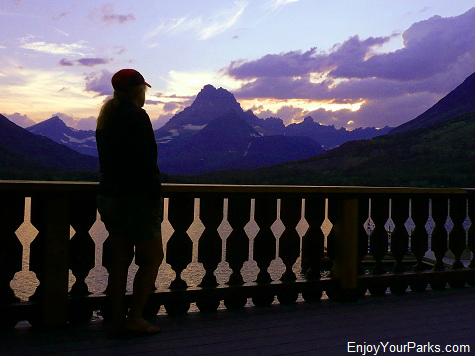 The Many Glacier Hotel Deck, Glacier National Park. 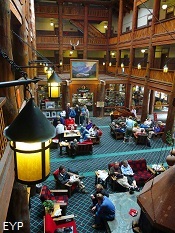 Many Glacier Hotel Dining Hall in Glacier National Park. 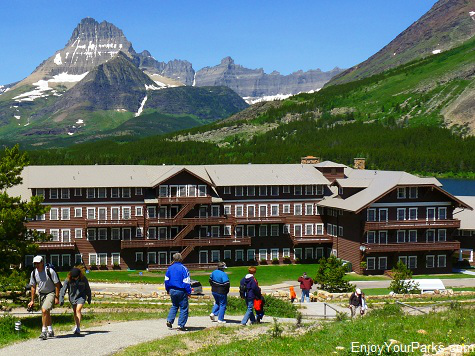 The Many Glacier Hotel in Glacier National Park is one of the most famous National Park lodges in the entire world. 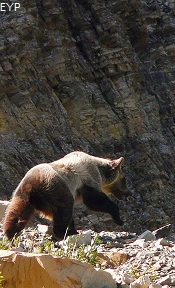 Grizzly Bear near the Many Glacier Hotel in Glacier National Park. 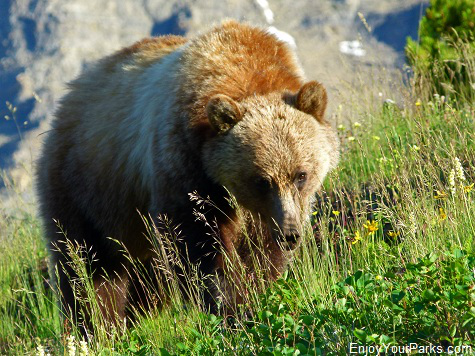 And if you like to watch grizzly bears, you can sit on the deck of the Many Glacier Hotel and watch these giant animals roam the hillside just north of the hotel during berry season (mid August). 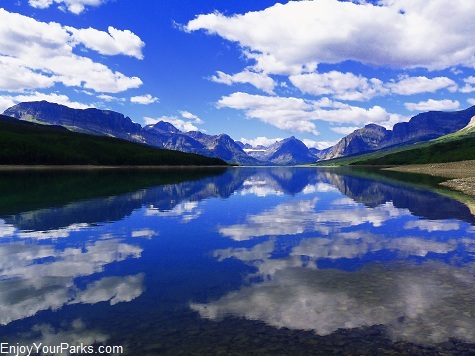 It's always a thrill to see these majestic icons of Glacier National Park. 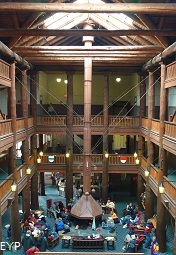 By the way, if you are fascinated by history and the stories behind this great lodge, the staff offers free tours daily. 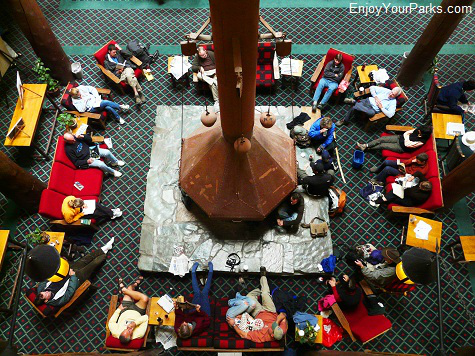 These tours are extremely interesting and entertaining. 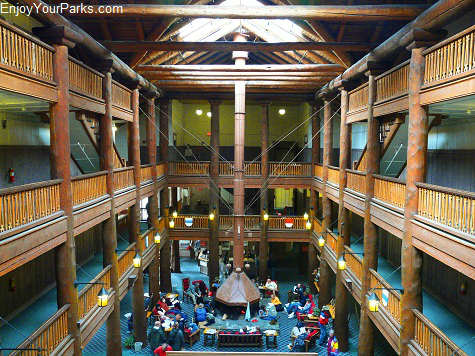 So if you like history and you are fascinated by great lodges, this tour is definitely worth your time. 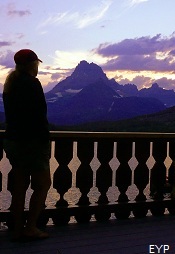 This is a typical late afternoon at the Swiftcurrent Motor Inn in Glacier National Park. 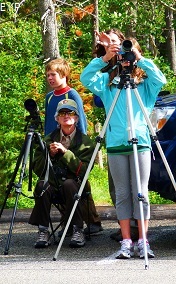 These guests are looking at grizzly bears on the hillside directly above the motor inn. 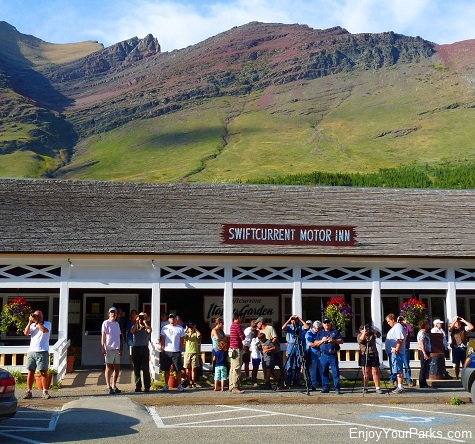 The Swiftcurrent Motor Inn is located just about a mile up the road from the Many Glacier Hotel, and this is where the Many Glacier Road ends. 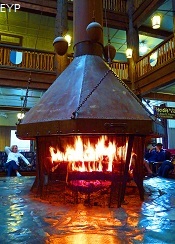 The Swiftcurrent Motor Inn Area includes a restaurant, camp store, showers, cabins and laundry. 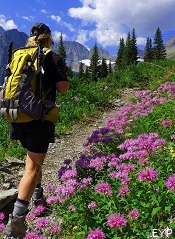 It is also where some extremely popular trailheads are located, such as the trailheads for Iceberg Lake, Ptarmigan Tunnel and Swiftcurrent Pass. 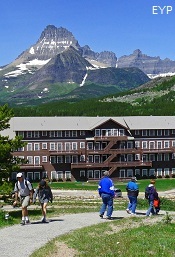 The Swiftcurrent Motor Inn in Glacier National Park is where several famous trailheads are located. 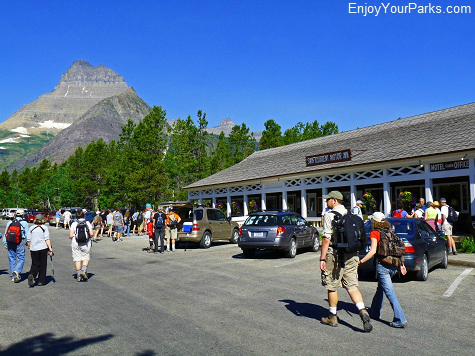 The parking lot in front of the Swiftcurrent Motor Inn is an extremely popular spot for visitors wanting to see grizzly bears during the mid-August berry season. 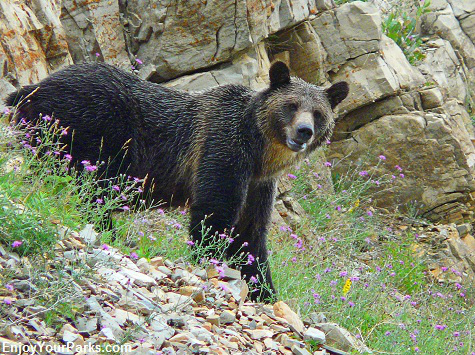 The mountainside directly above the Swiftcurrent Motor Inn is loaded with berries, and consequently is loaded with grizzly bears! 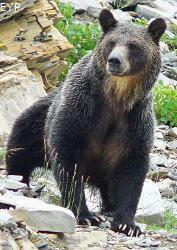 There are lots of grizzlies like this big guy, roaming the Many Glacier Area in Glacier National Park during the mid-August berry season! 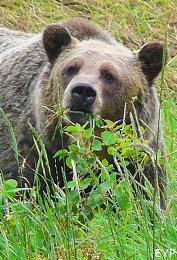 The bears are easy to see because of the open slopes above the Swiftcurrent Motor Inn, and there are usually rangers at the parking lot every evening with spotting scopes to help visitors get a good look at these incredible animals! 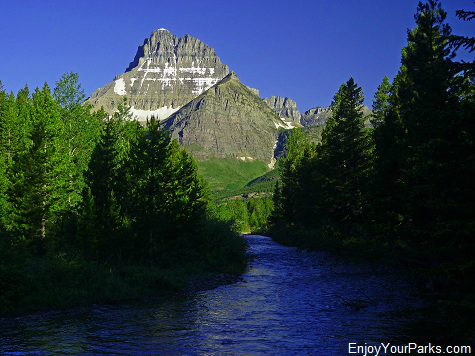 The Many Glacier Campground is located directly across the Swiftcurrent Motor Inn parking lot, and it is definitely one of the most picturesque campgrounds in Glacier National Park. 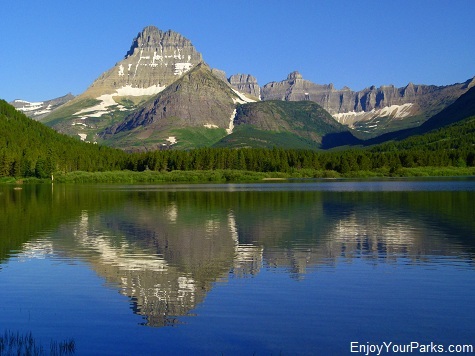 The Many Glacier Campground is nested between two mountains- Grinnell Point to the south and Mount Henkel to the north. 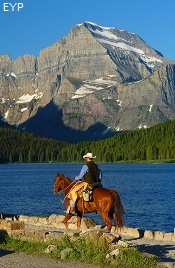 To the west looks Mount Wilbur and Swiftcurrent Mountain. 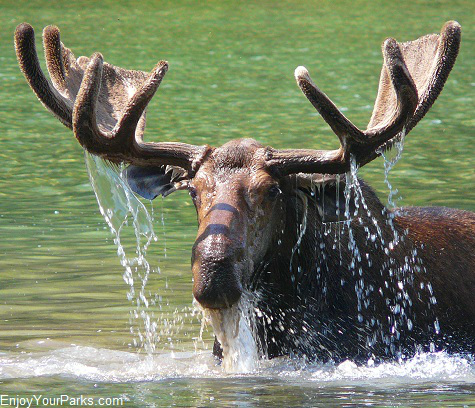 This is definitely our favorite campground in the entire park. 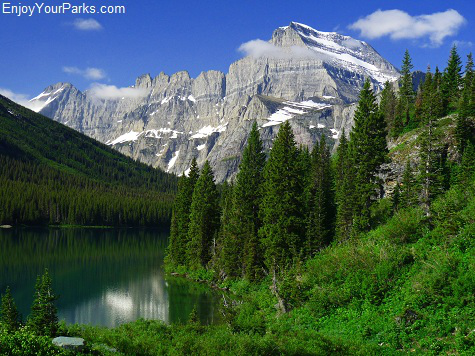 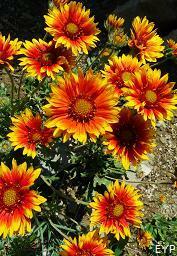 For more information on the Many Glacier Campground click here. 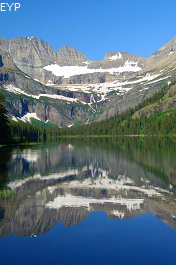 Click Here for more information on the Iceberg Lake Trail in the Many Glacier Area of Glacier National Park. 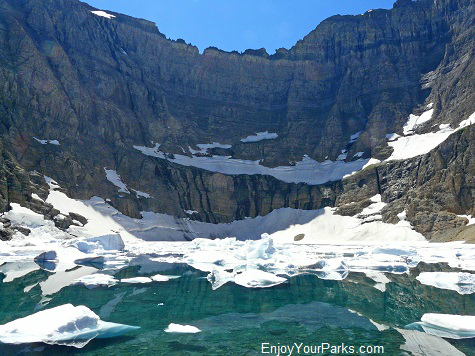 Click Here for more information on the Grinnell Glacier Trail in the Many Glacier Area of Glacier National Park. 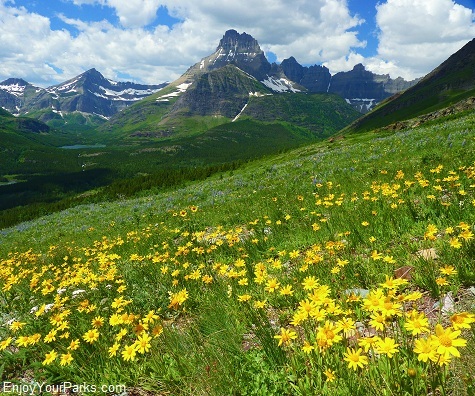 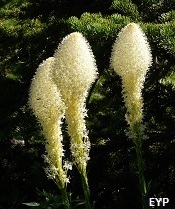 Click Here for more information on the Swiftcurrent Pass Trail in the Many Glacier Area of Glacier National Park. 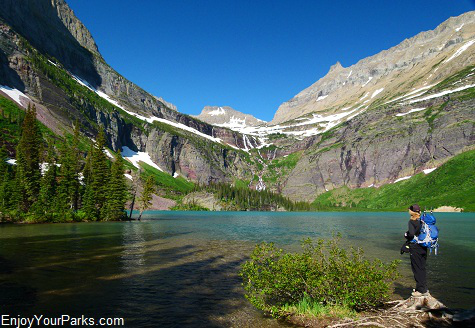 Additional hikes in the Many Glacier Area include Grinnell Lake, Swiftcurrent Lake Loop Trail, South Shore Lake Josephine Lake Trail, North Shore Lake Josephine Lake Trail, Ptarmigan Tunnel, Cracker Lake, Poia Lake and more! 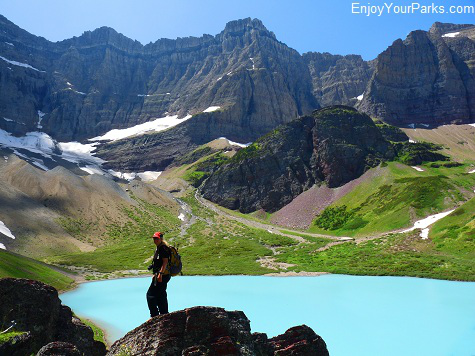 The Many Glacier Area is truly a hiker's paradise, having several of the best trails in North America! 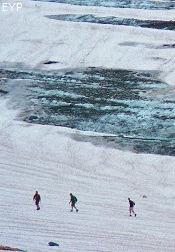 For the details on the Many Glacier Lodging Facilities, click here. 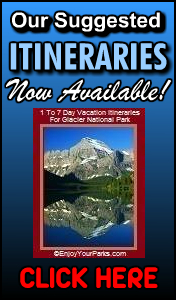 To help you maximize your enjoyment on your Glacier Park Vacation, we wrote an E-Book focused on our Suggested Itineraries for Glacier National Park. 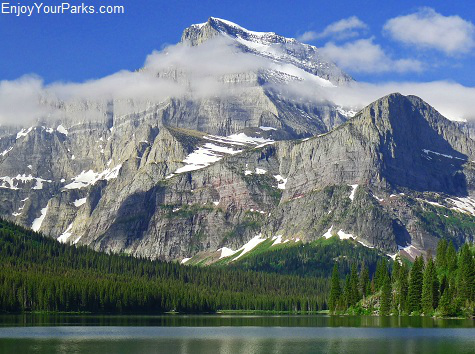 We also put together an "Ultimate Checklist" for everything you'll need (including hikes) on your Glacier National Park Vacation. 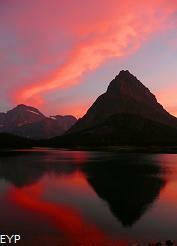 Swiftcurrent Lake with Mount Gould (left), Grinnell Point (center) and Swiftcurrent Mountain (right) in the Many Glacier Area of Glacier Park. 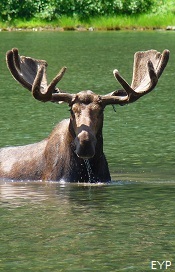 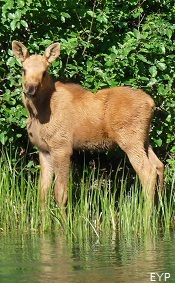 Bull Moose feeding in Fisher Cap Lake in the Many Glacier Area of Glacier National Park. 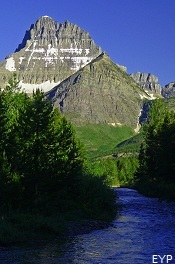 Mount Wilbur in the Many Glacier Area of Glacier National Park. 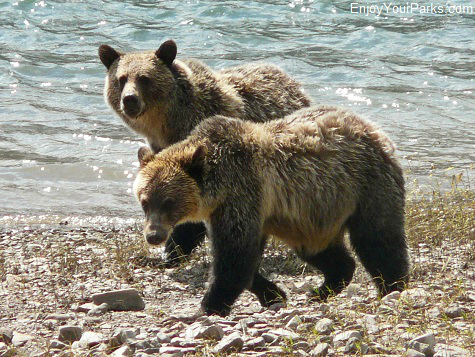 Grizzly bears along the shore of Lake Sherburne in the Many Glacier Area of Glacier National Park. 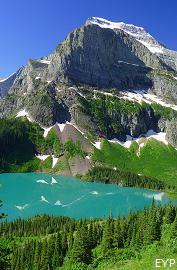 Iceberg Lake in the Many Glacier Area of Glacier National Park. 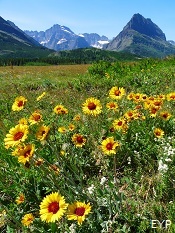 Meadow above Swiftcurrent Motor Inn in the Many Glacier Area in Glacier National Park, Mount Wilbur in the distance. 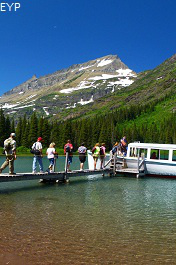 Lake Sherburne is the first lake to greet you as you enter the Many Glacier Area in Glacier National Park. 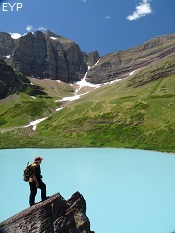 Cracker Lake in the Many Glacier Area of Glacier National Park. 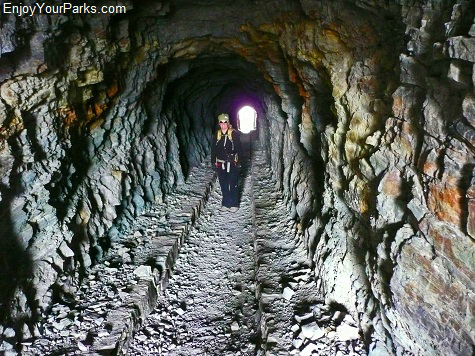 Ptarmigan Tunnel in the Many Glacier Area of Glacier National Park. 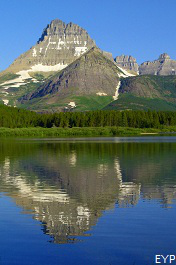 A view of Mount Gould along the North Shore Lake Josephine Trail in the Many Glacier Area of Glacier National Park. 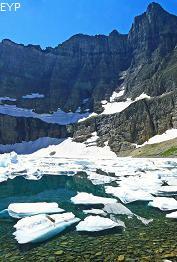 Grinnell Glacier in the Many Glacier Area of Glacier National Park. 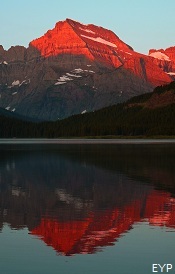 Sunrise on Swiftcurrent Lake, with Mount Gould and Grinnell Point. 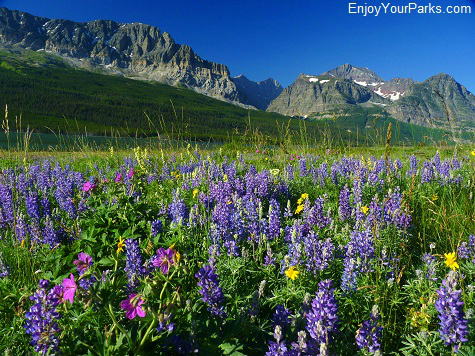 Wild flowers along the Many Glacier Road in Glacier National Park. 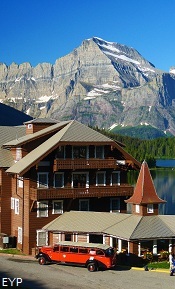 Many Glacier Hotel with Swiftcurrent Lake and Mount Gould, Glacier National Park. 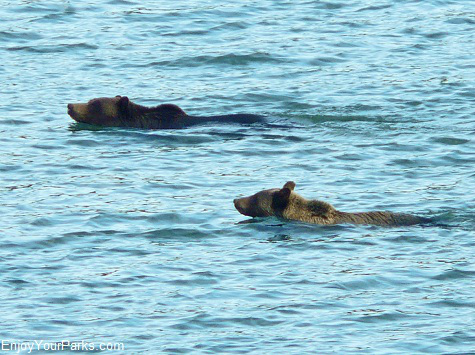 Grizzly bears swimming across Lake Sherburne in the Many Glacier Area of Glacier National Park. 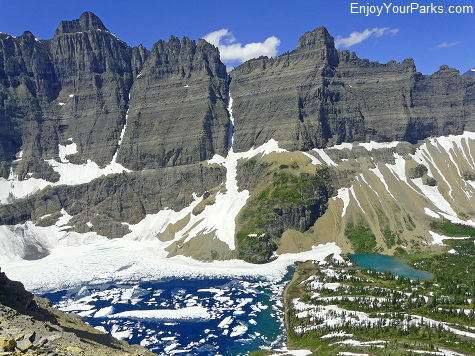 Mount Gould in the Many Glacier Area is one of the most famous iconic images of Glacier National Park.